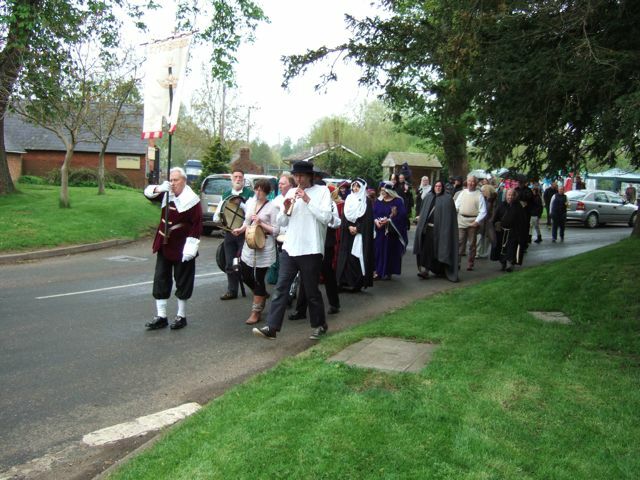 The spectre of an ancient Saxon warrior saint stalks the lanes and by-ways of Cropredy as villagers prepare every two years to celebrate the Feast of St. Fremund in grand style. 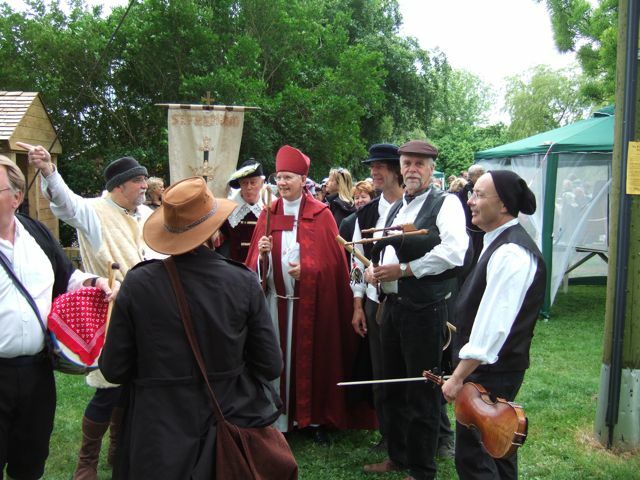 Parishioners look forward to welcoming a variety of distinguished guests of honour, for our first festival ion 2011 we were joined by Bishop Colin of Dorchester. 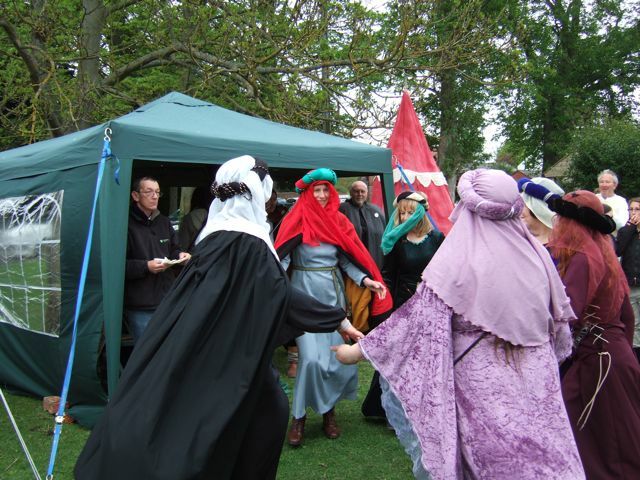 The central focus of the event is the promenade performance of a specially commissioned “Miracle Play”, a colourful costumed procession with music and dance. 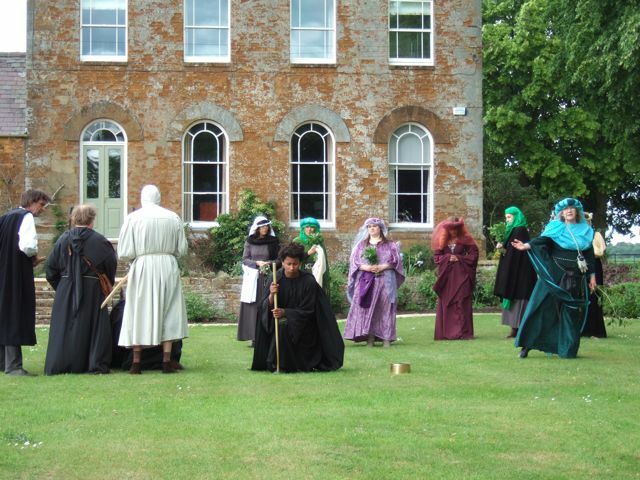 The play takes place at Prescote Manor before culminating in a service in the Church. The service, modeled on the annual St Frideswide Service in Oxford’s Christchurch Cathedral, features a song written for the occasion with words by villager Stephen Wass and tune by local musician Chris Leslie. 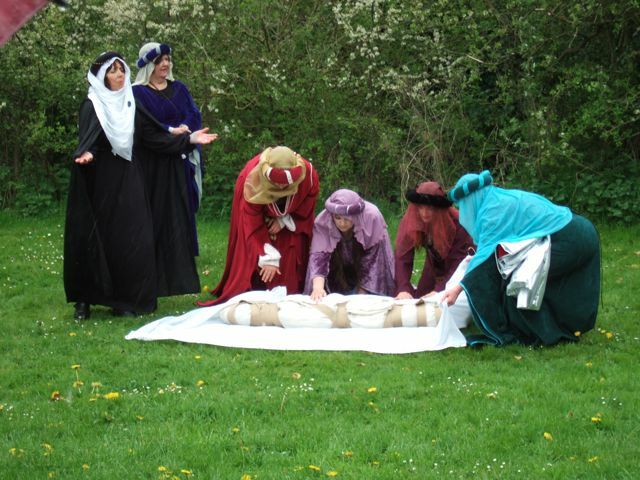 Following medieval tradition the play tells the story of St. Fremund’s life according to legend, with lots of drama and humour. 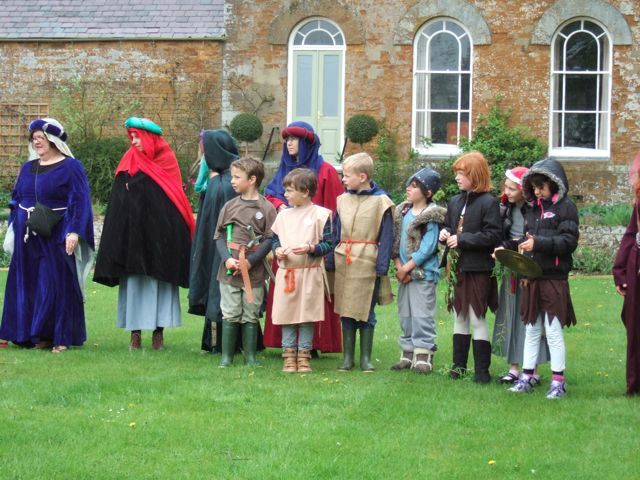 Son of the Saxon King Offa of Mercia, according to legend St. Fremund led a colourful life. A pious Christian hermit, on his father’s death he was persuaded to lead an army to defeat Danish raiders which he achieved by miraculous means. Decapitated by a rival nobleman after the battle, he picked up his head, walking away, and was buried at his father’s palace in Offchurch. His remains were subsequently moved to Prescote and Cropredy as a result of various strange visions, and the intervention of crippled virgins. In reality he was probably a victim of “pilgrimage wars” during the Medieval period. His relics were closely linked to Prescote and moved to Cropredy at the time of St. Birinus, Bishop of Dorchester. His chantry chapel, now replaced by that dedicated to him in the south aisle of the nave, features in wills as late as the 16th century. His remains were finally bought by and moved to Dunstable Priory during the reign of King John. 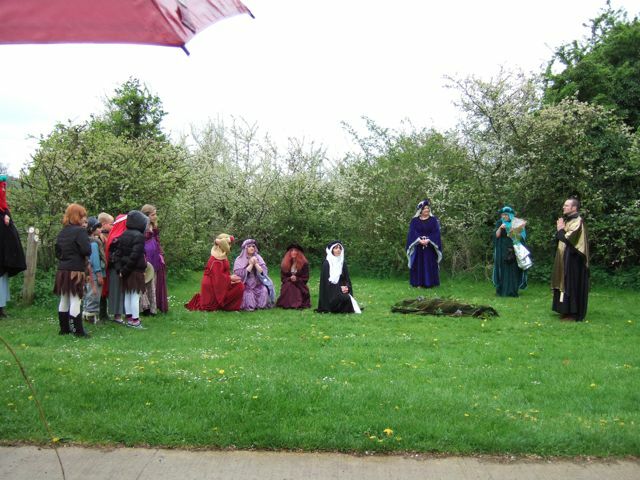 The event opens at lunchtime with St. Fremund’s Fair, an outdoor gathering where people can enjoy traditional food, drink and entertainment, with some medieval themed stalls. 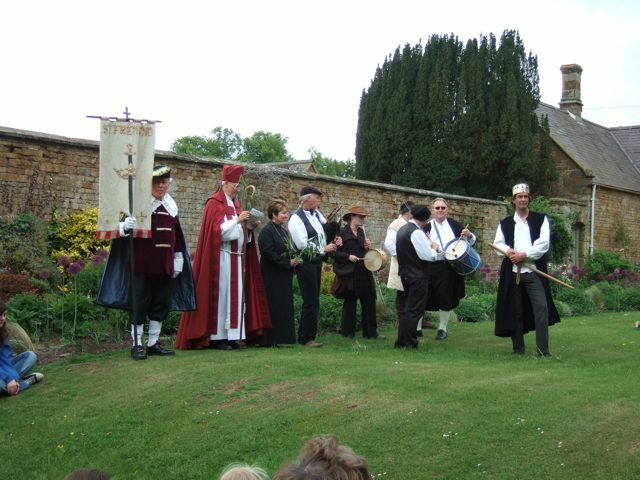 The performance of the miracle play begins during the early afternoon with a procession out to Prescote followed by the first scene. 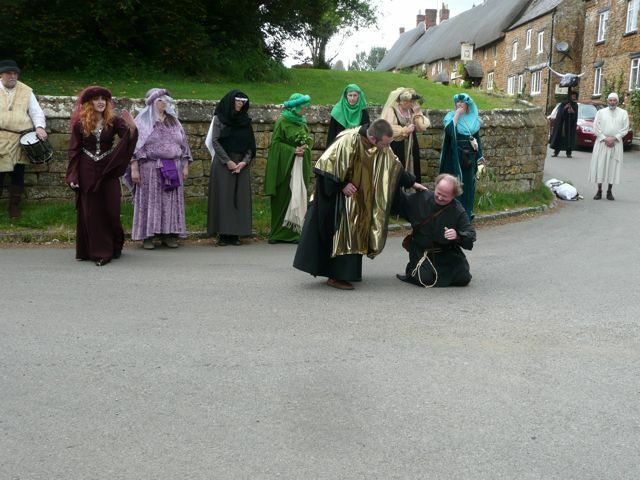 The cast and audience then proceed round the village acting out the legend before forming up for a final procession to the church for the last scene followed by a special service. Now, come close and listen / our story starts! At last found here / that Cropredy is blest. Our story is of Offa’s / first born son. God’s own bounty / and blessings to pursue. Lasting long / yet loving God’s clarion call. To rest at last / and be blessed all in His sight. Their willing work is done / but peace there’s none. So soon he is recalled / to martial ways. Takes up his singing sword / and bent back bow. For kingly Offa’s noble course / is run. To take his men / into the fighting fray. The Mercians stand strong / against the pagan Danes. And bodies burn / aloft on pine wood pyres. And then from out the darkness / Oswy draws near. Take up this kingly crown / to rule us well. “My father’s hall / in heaven’s kingdom lies. Us all, demands our duty / and our love. Breaks down / and repents his sudden storm. 2011 Oswy breaks down following Fremund's murder. around / as if looking for a place to ease his thirst. 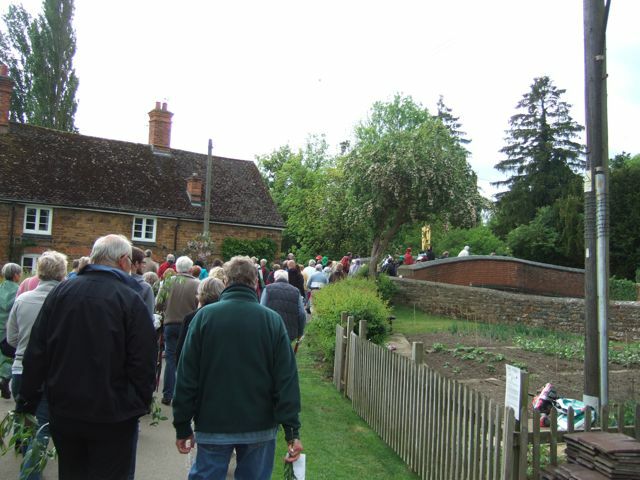 2013 Villagers look on as Fremund starts to walk. The Royal palace / at Offchurch Bury. Of the purest water / any have seen. His bleeding battered head / and bloodied hands. Then embracing death / he enters God’s kingdom. And prays to the new made saint / for forgiveness. In turn / washes away his sinfulness. Fremund’s sepulchre / sinks into the clay. An air of sorry neglect / and decay. A saintly man / should not be treated so. not covered over / by some mossy mound. 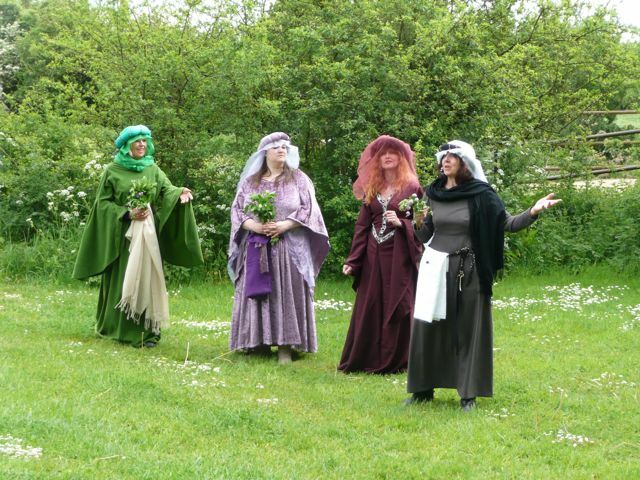 2011 three crippled virgins and their mother abbess. Of a golden column of light / displayed. 2013 The virgins receive their instructions from a passing angel. “I, from the moment of my birth, / was blind. Have passed my waking hours / in death like dark. My ears and now for years / in silence live. Struck and beat me / about my head. 2013 Fremund's bones are gathered up. Dug down, / the saintly bones to discover. Made their way / to the meeting of the rivers. The three there were met / by five priests, grey haired. Glad voices praising God / each then was cured. And cattle and sheep graze / and the Plough draws out the furrow. 2013 Even the cattle are fascinated. 2011 The procession crosses the canal bridge. Erases all / and Fremund’s grave is lost. The sickly cattle / gives notice of the past. Day spends time in prayer, / who every night dreams. That proclaims / there’s something he ought to do. Three times, three he dreams, / every night the same. Has no time for visions / forced into his dreams. “Now listen well. / My message is clear. Gives you this charge / and these sacred signs. with seven suckling offspring. / Find his bones. 2011 Angel wrestling, Albert comes off worse. “I can not do it! / I will not do it! My devotions here / are incomplete. I cannot leave! / I will not leave! And awakes / with a dislocated arm! It’s a sign , it served him right, / everyone said. his way by Cropredy / to Prescote. He finds the bones / and clasps them to his heart. He loads them carefully… / onto a cart. 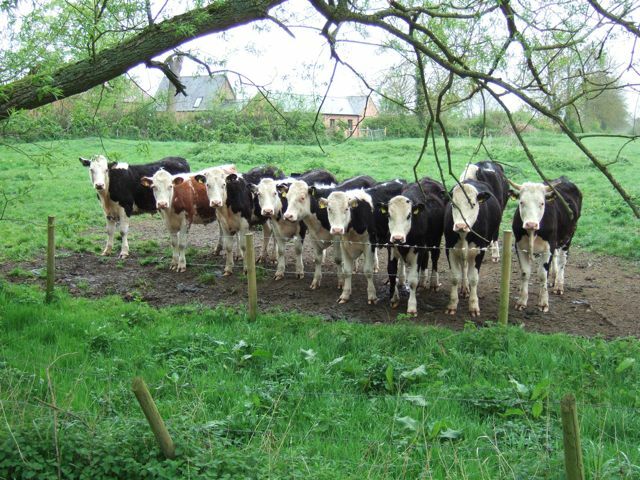 But close to Cropredy / the ox stops dead. No going forward. / and no going back. “You heartless beast, / my task’s not halfway done. And chomp on the grass / in that gormless way. “Now what you got there / is a miracle. Let’s be clear, / that cart’s going nowhere. And pilgrims came / to worship… and to trade. Is calmly laid at / Saint Fremund’s door. But Dunstable’s / the coming place to be. King John is keen to see / redevelopment. The priory there / clearly needs a boost. What better / that the relics of a saint? “I am the wealthy Prior / of Dunstable. This ancient church / is really quite unstable. Those bones you have / are surely portable. Blessing this village round. / Praise God! Amen. 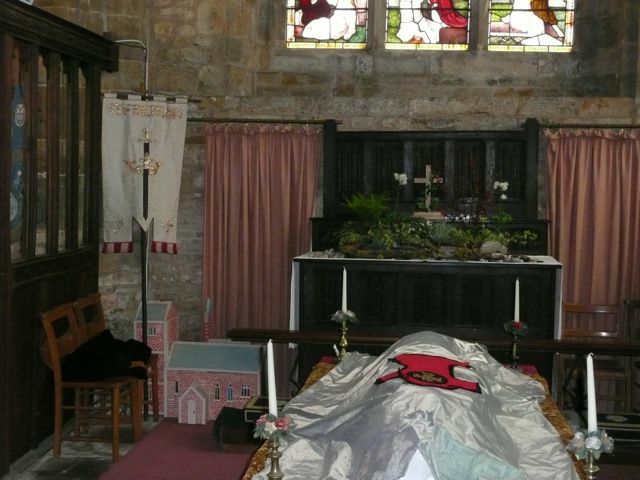 2011 Fremund's shrine in Fremund's Chapel. Please gather round for the final scene. You are then invited to sit for the Service. Following the welcome and prayer, our service is divided into four sections, each section beginning with verses from the Ballad, played and sung by our musicians. You give me to plough. to sail across the sea. Lord, guided by you, and our blessed Fremund, you brought us here to worship you in quietness and solitude. We learned to love the beauty of this island, hanging here between sea and heaven. The cry of the gulls echoes our songs of praise, the gentle puffins murmur soft encouragement as we work in our simple fields, the ever-changing song of the sea fills our hearts with awe, and fear, as we pray for your blessing on our endeavours, oh Lord of all. We thought our lives were settled, that we would live out our lives in praise to you, untroubled by the world’s strife. 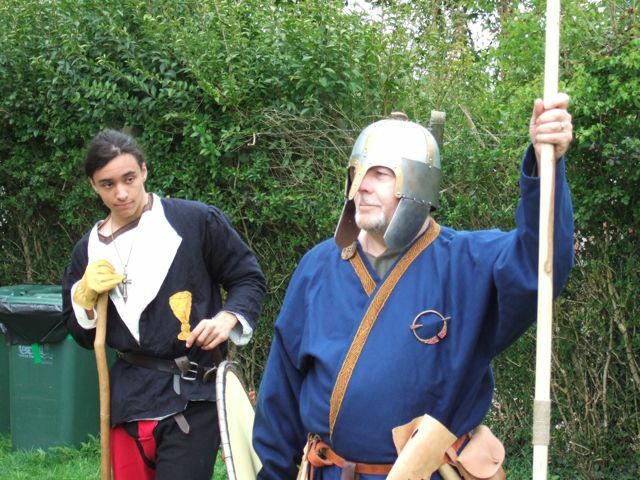 But now Fremund must leave us, must face the heathen foes in Mercia, whence we came. Bring him safely back to us, we pray, or if it be your will, take him victorious to live with you in heaven. God be at mind end, and at my departing. And Fremund leads the host. The violence sickens him still. The bodies pile up high. The ragged field now runs with blood. The smoke it stains the sky. The crown lies in his hand. It’s back to God’s island. The battle is over – the dead lie unnumbered, chief amongst them our king, Offa. His son, Fremund, offers prayers for the dead. To him now falls the crown, but he will have none of it. His life is dedicated to the Lord, there lies his path, he will return to his holy chapel on Lundy. But what of us? Do we count for nothing? We fought, we died, to give him this victory. What kind of man would turn his back on his people at such a troublous time as this? God has need of him, he says, but what of our need? Are we to be left leaderless now? Can nothing change his mind? Maybe God has need of him, but so do we. As God reigns in heaven is it not right for Fremund to reign on earth? We are but simple men, to us it is our homes, our families we fought for, as well as for God. Who will solve this dilemma for us? Help us to open up the road to reconciliation. To plant and water seeds of trust. A warrior good and wise. But see he’s standing still. He feels the broken ground. To keep it from all harm. All. To look beyond the deceptions and illusions of the world to the Way, the Truth and the Life of the Spirit. All. And our neighbour as ourself. We are a one-world family. All. As we show compassion and care to all. He bows his head to pray. A Pilgrim, God’s wandered, peregrinate pro Christi… Our lives are a pilgrimage, we follow a steep and rocky path, near impassable in places, but we travel onwards for we know this path leads to God. Fremund trod this path, sometimes with companions, sometimes alone. His path was not an easy one, his life, so full of promise as a servant of the Lord, took him along a way he did not wish to tread, to battle, to bitter conflict over his future path, to his death. Each of us is a pilgrim. Some take this name to themselves as they travel through the land visiting shrine after shrine, beseeching the saints contained therein to aid them in their journey. For so many centuries men have begged the blessed saints to help them tread their path, fight their battles, be ever at their side. For so many centuries women have brought their troubles, of health, family, fears for the future for themselves and those they love, laying these burdens gratefully by the shrines of your saints. But the complications of life surround so many of us here, we could not be such pilgrims even if we wished it so. We tread our own paths of the heart, asking only that our journey through life will make us fitter to stand with the company of saints before the throne of God. If, in our passing we have helped others in ways small but heartfelt, we have done well in our journeying. We seek the blessing of God and his saints, their help and guidance in all we do. May our pilgrimage of life be an adventure into the heart of God’s love. Move our hearts with the calm, smooth flow of your grace. Let the river of your love run through our souls. May my soul be carried by the current of your love, towards the wide, infinite ocean of heaven. Together we say the Lord’s Prayer. All. Deep peace of the running wave to you. Deep peace of the Son of Peace to you. Amen. The blessing of God be upon you as you go out into the world. May we abide in the Light, that we may be lights in the world, held together in love. Amen. As you leave, the musicians will play. You are invited to take a piece of willow, and add it to the willow sculpture around the old Font. Tea and biscuits will be served following the service. 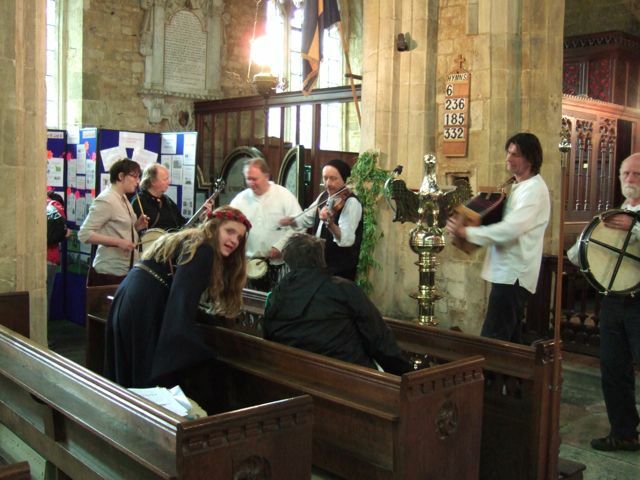 2013 The band playing in church.